Apollo x6 features selectable operating level for compatibility with professional +24 dBu gear, as well as an integrated monitor controller and built-in talkback mic. Apollo x6 features HEXA Core processing with six DSP chips and 50% more UAD plug-in processing power than previous Apollos. This lets you run more UAD plug-ins, whether you’re tracking in real time with channel strips from Neve, Manley, or API, or running high UAD plug-in counts when mixing in your DAW. Perfect for electronic musicians and post production professionals who don’t require tons of mic inputs, Apollo x6 features two Unison-enabled mic preamps, letting you track through exacting mic preamp emulations from Neve, API, Manley, SSL, and Universal Audio. ** A Universal Audio exclusive, Unison technology nails the tone of these sought-after tube and solid state mic pres — including their input impedance, gain stage “sweet spots,” and the component-level circuit behaviors of the original hardware. The secret to Unison is its hardware-software integration between Apollo’s mic preamps and its onboard Realtime UAD Processing. 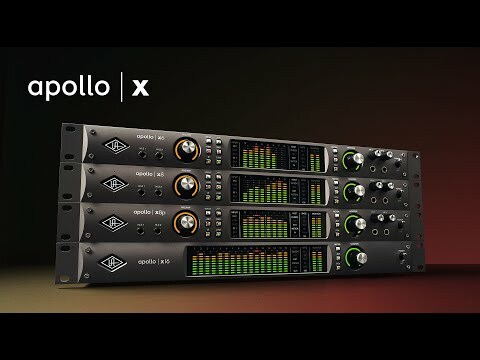 **Apollo x6 includes the “Realtime Analog Classics Plus” UAD plug-in bundle. Other UAD plug-ins sold separately at www.uaudio.com. All trademarks are property of their respective owners.